Judging by the amount of aquarium rocks found all over our house, I thought it was time to change out the sensory box. Pinky was very interested in the polyfill stuffing I used last week to stuff the UFO ornament that I made, and I thought it would make a perfect medium for the sensory box! I filled the box with polyfill stuffing, cotton balls, confetti hearts (for Valentine's Day), various sizes of foam hearts, different lengths of cardboard tubes to stuff (toilet paper and paper towel rolls), and two stuffed animal forms from her Chicken Socks book. If you don't have these, you could very easily stitch together scrap fabric or felt into various shapes for stuffing. Just be sure to leave one side open. 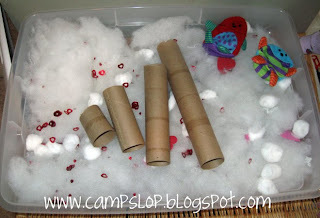 I hope the kids have as much fun with this sensory box as they did with the last one!